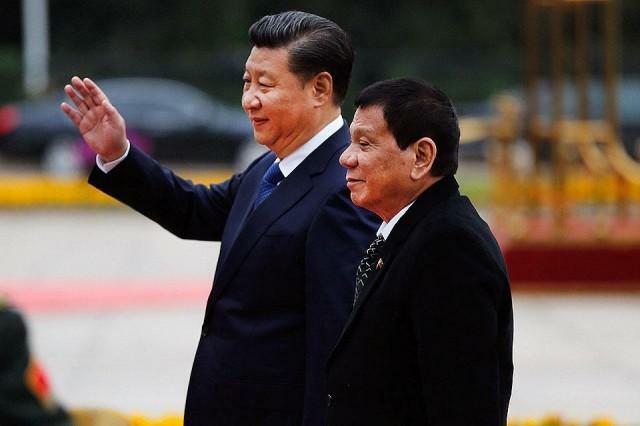 MANILA -- Chinese Ambassador Zhao Jianhua on Thursday night said Philippines and China are preparing for President Xi Jinping's state visit to the country by end of the year. "The plan is that he will come to the Philippines for a state visit but the specific date and month have not been finalized yet so we’re in close coordination with the Filipino side to prepare for the, most likely, state visit," he told reporters in Makati City. Xi was invited to the Philippines by President Rodrigo R. Duterte when they first met in October 2016. Department of Foreign Affairs Secretary Alan Peter Cayetano earlier said the two sides are eyeing the month of November for the trip after a mutually accepted draft agreement on the joint exploration in South China Sea is signed. An agreement, however, was stalled after the set official visit of State Councilor and Foreign Minister Wang Yi on September 16 was cancelled due to a typhoon that battered the Philippines. Cayetano said the two sides' talks on this partnership are on track. Meanwhile, Zhao said Beijing and Manila have not come to a conclusion yet, but both parties are "serious" in the possibility of a joint exploration. "I think both sides have realized that this will first and foremost maintain stability and peace in the South China Sea," he said. During his speech at the reception of the 69th Founding Anniversary of the People's Republic of China in Makati Shangri-La, Zhao cited the "sustained betterment and growth" of relations between the two countries since Duterte assumed the presidency. "Over the past two years, a series of dialogue and consultation mechanisms have been revived in areas such as foreign affairs, defense, energy, economy and trade, agriculture, fisheries, science and technology," he said. "There have been also increasing interactions and exchanges between local governments, media agencies, universities, think tanks and cultural institutions. In the meantime, China and the Philippines have maintained good communication and coordination on international affairs," he added. In tourism, he reported that the Philippines already received more than 760,000 Chinese tourists in the first seven months of 2018, achieving a 40 percent year-on-year increase and about 50 percent of the targeted arrivals by end of the year. "We have every reason to expect more than 1.5 million Chinese tourists to visit the Philippines this year and generate a revenue of more than 32 billion pesos," the envoy stressed. The two countries continue to work closely to combat illicit drugs, terrorism and cyber-crimes, he said. During his short conversation with Defense Secretary Delfin Lorenzana at the reception, Zhao lauded China and the Philippines' military-to-military relationship which already "turned into a new phase." "First, I expressed my appreciation for his participation in our National Day celebration," the envoy told reporters when asked what was discussed during his chat with the Defense chief.